Special edition release. Aromatic & smoky. Made with pride on Orkney.According to the old Norse sagas, for Viking warriors, death was not an end but a glorious beginning. And it began with the Valkyries... Exquisitely balanced and delivering wave upon wave of warm aromatic smoke and richly ripened fruit. Heathery aromatic smoke from the Orkney peat infuses the barley which we then hand turn - this is what gives Highland Park whiskies their distinctive flavour. Natural cask driven colour (no additives) from the Oloroso sherry oak casks that we use to mature our whisky in. 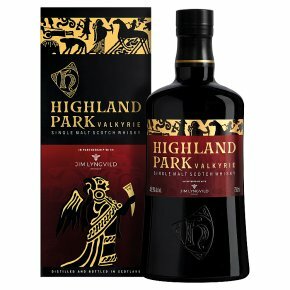 Flavours Green apples , Sun-ripened lemons , Oriental spices , Vanilla , Preserved ginger , Dark chocolate , Salty liquorice , Warm aromatic smoke Valkyrie is the first in a series of three special Viking Legend releases and has just been awarded the Chairman's Trophy in the 2017 Ultimate Spirits Challenge, scoring 99 out of 100.